Somnambulant Gamer: Give me More Papers, Please! Give me More Papers, Please! Papers, Please is the independent game that is currently absorbing the lives of every game writer and journalist, the world over. It's described as a "Dystopian Document Thriller," which is accurate, but doesn't exactly smack of intense gameplay. 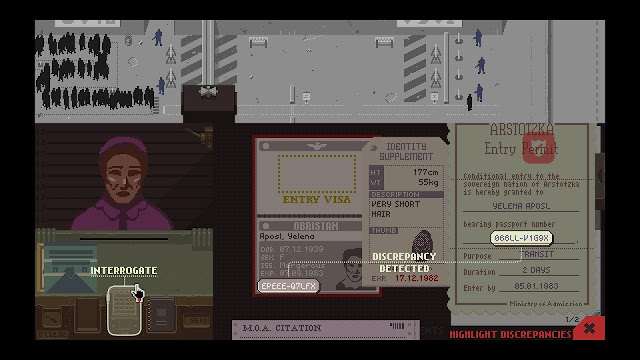 Trust me though, Papers, Please will make you sweat. The game plays out through only one location, your assigned border crossing kiosk. Your job, as assigned by the glorious Aristotzkan government, is to monitor the crossing of people along the border and assure that all their papers are in order. It seems easy enough. But there are complications. Many people will attempt to hand you fake documents. The differences can sometimes be very subtle, so it's important to be thorough. At the same time, you are only paid for every successful interaction, so efficiency is equally important. Did I mention that your pay goes towards providing heat, feeding, and housing your family? Counting your successful interactions throughout the day can get pretty stressful. And while the guy who always brings you fake papers may be entertaining the first couple times you see him, you quickly learn to despise him. After all, the more time he spends trying to convince me that Cobrastan is a real country, the less money I am making. My child is sick and cold, and if I don't get through at least five more people through here before the end of the day, I won't have enough to pay for heat and medicine. What starts off as an interesting little game becomes the most nerve-wracking nine hours of your life. You see, I'm not very good at Papers, Please. In fact, I'm terrible. Every day, I let at least two people through who shouldn't have been allowed in. At one point, I even neglected that while the persons passport said male, they were clearly a woman. Papers Please is impressively immersive. The game takes advantage of our minds desire to fill in gaps. By not giving a lot of detail, context or back story, or even any other environment, it allows the player to fill all of that empty space. I spend more time wondering where each of the people at window are going and what they are like than I do actually examining their papers. 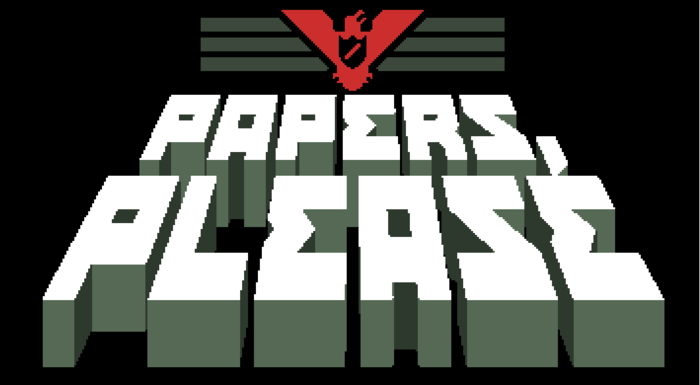 Papers, Please is available now on Steam. It's a delight to play, and without a doubt will be absorbing a lot of my time. Now, if you'll excuse me, I have a lot of people left in line and I don't get paid for anyone crossing after 6pm. Glory to Arostotzka!